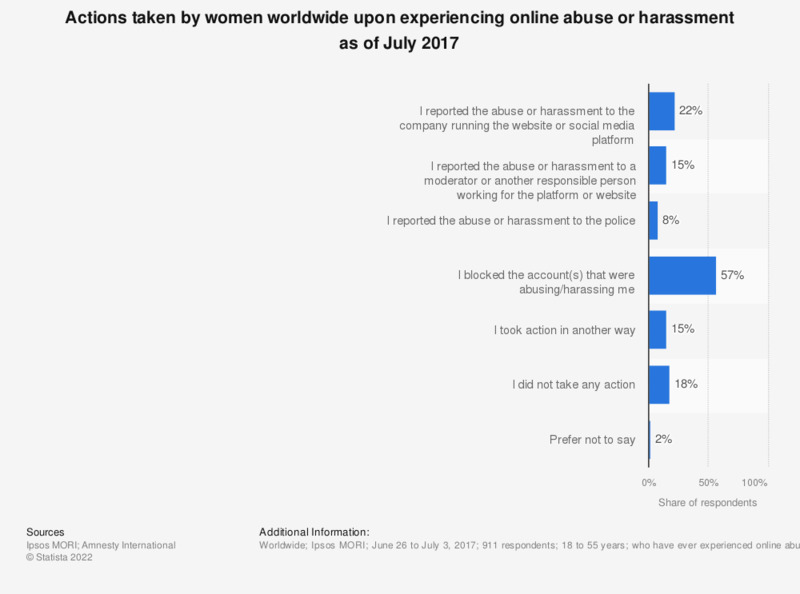 This statistic presents the most common actions taken by women worldwide upon experiencing online abuse or harassment. During the July 2017 survey period, 57 percent of survey respondents who have experienced online abuse stated that they had blocked the account that were abusing or harassing them. Only eight percent of respondents had reported online harassment to the police. Countries surveyed: UK, United States, New Zealand, Spain, Italy, Poland, Sweden, Denmark. Everything On "Social media usage worldwide" in One Document: Edited and Divided into Handy Chapters. Including Detailed References. Have you experienced gender-based hate speech within the last two years?